As if the good people of Bell, California didn’t have enough trouble. 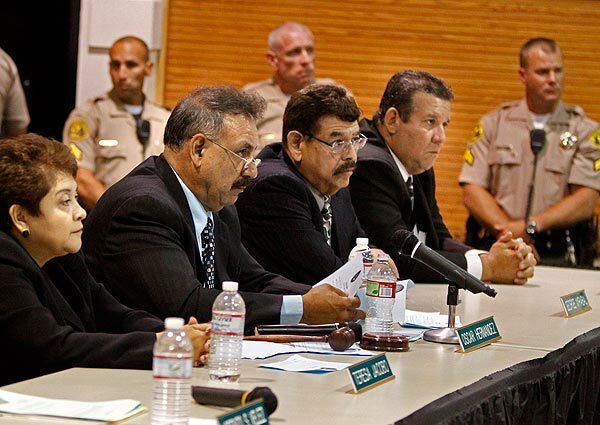 In July, the Los Angeles Times disclosed that officials in this poor Latino town of 37,000 residents were among the highest paid local officials in the US. The city manager (2009 salary: $787.637), the assistant city manager ($376,288) and the police chief ($457,000) were forced to resign amid public backlash over their lavish compensation. As a result of the negative publicity, the State of California required local governments to post payroll details on their websites. The City’s director of administrative services and director of general services both are paid over $420,000. The director of community services and the deputy city engineer were probably chagrined to learn they were paid just over half — $240,000 plus each — of their colleagues. The Police Department was no stranger to the municipal largesse. Two police captains are paid over $235,000 per year. A police lieutenant is paid just under $230,000. Two police sergeants are paid over $165,000. In total, forty-five city employees are currently paid salaries over $100,000. Meanwhile, Bell is one of the poorest communities in Los Angeles County. But, this tale of greed at the public trough doesn’t end with ridiculous salaries. 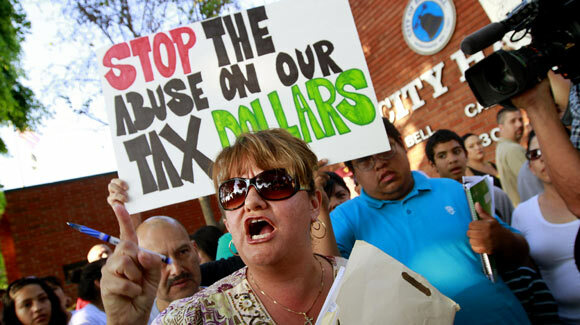 KTLA-TV reports that city officials overcharged Bell residents nearly $3 million in property taxes. An audit by the State Controller found the city raised the municipal pension portion of the property tax level nearly 48% from 2007 to 2010. The increases were in violation of state law which froze those rates at 1983-84 levels. In another development, the Los Angeles Times reports that fifty city employees received “loans” from city funds. For example, the former city manager received loans totaling $160,000 due to “financial difficulties” despite his $787.000 salary. The assistant city manager received loans of $200,000. Other employees received loans to assist them in purchasing homes, and as Bell has no city residency requirement, most were homes outside of the city. It seems clear we haven’t reached the bottom of this cesspool yet. © 2010 by kens*ten. All rights reserved. The Park District of Highland Park (IL) has joined the sky-high local government payroll club. The Chicago Tribune reports that the local taxing body significantly raised salaries and granted large bonuses to key administrators — in one case over 300% — specifically to augment their pensions. Park District executive director Ralph Volpe received a 2005 salary of $138,733, the Park District Board raised his total compensation 313% to $435,203 by 2008. Volpe’s total compensation in 2008 was greater than the $400,000 salary paid to President Barack Obama. The 2005 salary of David Harris, district facilities director, increased from $135,403 to $339,302 including bonuses in 2008 — an increase of 250%. Kenneth Swan, the district’s finance director, 2005 salary increased 174% from $124,908 to $218,372. The total compensation paid to both Harris and Swan in 2008 exceeded the $155,600 salary of the Illinois Governor Patrick Quinn. Running a $20 million park district deserves compensation exceeding what we pay the “Leader of the Free World”? I don’t care how rich your town is, that is just insane. Couldn’t the park commissioners in Highland Park have found a better way to spend nearly $1 million of taxpayer funds? Maybe, on playground equipment or sports fields… or here’s a crazy thought… charging less to participate in park district programs. No, they chose to reward their “employees” with a retirement of luxury… on the taxpayer’s dime. The good citizens of Highland Park should follow the course of their brethren in Bell, California. They should seek the immediate resignation of the park district commissioners who approved this gross misappropriation of public funds. The Los Angeles Times stumbled across the local government story of the decade. Times reporters were investigating the story of Maywood, California – a town so badly off economically they chose to fire all their city employees and pay contractors to perform minimal city services. One of the contractors was the neighboring City of Bell. In the course of covering this story, the Times discovered that Bell has what may be the highest paid city officials in America… and perhaps, the world! Now that’s the motto you’d want on your “welcome to town” sign, huh? The good citizens of Bell are paying their City Manager an annual salary of… you had better sit down for this… $787, 637. And, his contract calls for a 12% raise – over $94,000 — in July 2011. Sure, that ain’t much in sports terms. But in the realm of public administration, he’s taking down major league coin. Let me put Bell City Manager Robert Rizzo’s wages into relative terms for you. President Barack Obama’s yearly salary is $400,000 — about half as much. Los Angeles Mayor Antonio Villaraigosa is paid $232,425 per year — less than one-third. California Governor Arnold Schwarzenegger’s annual salary is $173,987, which he refuses, because The Terminator is a gazillionaire. This City Manager is getting paid nearly five times more than the governor of the largest state in the nation! Is It Time to Bury Harry? Obama is In Over His Head… Duh! What’s the Matter with Broward County? This blog now features YouTube video content and AddThis post sharing. Yipeeeee! There is a very simple story behind kens*ten. I like to write and I am a political junkie -- always have been. My politics are conservative. So, I write from that viewpoint. kens*ten features... ahem... 10 front page posts. More posts are available, just check the "This Month" and "Older Posts" areas. Thanks for visiting kens*ten. (C) 2010 by kens*ten. All rights reserved.